The 2019 Chevy Colorado is a truck that will be sure to exceed your expectations. Whether you’re a seasoned truck enthusiast or new to the truck game, you’ll be impressed by what this truck has to offer. The 2019 Chevy Colorado has an extensive amount of safety and technology features that will be sure to impress even the toughest critics. If you’re in the market for a new truck it’s imperative that you see what the 2019 Chevy Colorado has to offer. You’ll be pleasantly surprised. With the 2.5L 4-Cylinder engine, you’ll find a variety of power and performance specs that will impress you. Whether you’re looking to select this vehicle for off-roading, for towing the boat to the landing, or simply for getting from point A to point B, you’re going to love the sheer power that lies under the hood of the 2019 Chevy Colorado. With an impressive 200 horsepower, you’ll find that you’re able to navigate difficult terrain with ease. Furthermore, you’ll get 191 lb-feet of torque, which is actually more than any other competitive 4-cylinder engine. With this engine, you’ll also be able to enjoy 3,500-lb towing capacity. This will make taking your new truck for adventures a breeze. Lastly, you’ll be able to enjoy 20 MPG in the city and 26 MPG on the highway, which will mean that your wallet remains happy. If you’re looking for a truck that challenges the standards set forth by previous trucks, this is it. It’s time to invest in a truck that is worth your while; the 2019 Chevy Colorado. Undoubtedly, most customers find the safety information important, if not critical, to know prior to purchasing a vehicle. If you’re going to be spending a significant amount of time in your vehicle, you’re going to want to ensure that it’s able to keep you safe and protected, even in undesirable situations. The Colorado features an abundance of safety features and capabilities to keep you safe in a variety of unforeseen circumstances, including its high-strength steel frame and reinforced cage, Rear Vision Camera, a full suite of carefully place airbags, Traction Control, Forward Collision Alert, Lane Departure Warning, and much more! The fact that the 2019 Chevy Colorado places such a high emphasis on your safety shows that it’s a vehicle that’s worth your investment. This truck will keep you safe on the road and will protect you from potentially hazardous situations. For example, it can be difficult to navigate hectic highways and ensure that you’re staying in your designated lane. For this, the 2019 Chevy Colorado will provide you with a warning should you begin to depart from your lane. Additionally, you can depend on the StabiliTrak with Traction Control features to keep you safe in inclement weather. No matter what you’re looking for, you’ll find it in the 2019 Chevy Colorado. The infotainment system on the 2019 Chevy Colorado will provide you with everything that you’re looking for, plus some extras. Customers are loving the fact that this vehicle includes wireless charging capabilities and multiple USB ports. Some other popular connectivity features include both Apple CarPlay and Android Auto, Bluetooth, an intuitive infotainment system, a rear vision camera, built-in 4G LTE WiFI, and more! This truck will absolutely revolutionize the way that you drive in the 21st century. Due to the fact that there are such a high amount of connectivity and technology features offered, you won’t have to worry about taking your eyes off the road for a minute. If you choose to upgrade to the 3.6L DOHC V6 engine, you’ll be impressed with the way that the specs improve. The horsepower that will be achieved through the 3.6L DOHC V6 engine is 308, while the torque is 275 lb-ft. If you’re looking for a more powerful option to the standard engine, you’ll love the 3.6L option. Furthermore, you’ll see an increase in towing capacity from 3,500 lb to 7,000 lb, which is undoubtedly exciting for those who love adventures. If you’re looking for a vehicle that will exceed your expectations when it comes to power and performance, look no further than the 2019 Chevy Colorado. If you’re looking for a vehicle that will keep you safe and protected while on the roads, you’ll love what the 2019 Chevy Colorado has to offer. The Rear Vision Camera is a feature that will revolutionize the way that you drive for a number of reasons. Largely, this is due to the fact that you’ll be much less likely to cause an incident while backing out of a difficult driveway or parking spot. Furthermore, if you’re involved in a collision of some sort, the variety of airbags offered will keep you safe and protected. There are countless reasons to decide to invest in the 2019 Chevy Colorado, however, the safety features are definitely among the top few reasons. If you’re in the market for a new truck, don’t waste time shopping around. Test drive the 2019 Chevy Colorado today to feel the difference for yourself. You’ll be glad that you did. The fact that there are so many opportunities to connect your phone to your vehicle means that you’ll have less of a chance of finding yourself as a distracted driver behind the wheel. Instead, you’ll have the tools necessary to drive smarter and safer. The 7-inch color touch-screen display provides the driver with the information and accessibility necessary to use it with frequency. Furthermore, the 4G LTE WiFi will definitely enhance the next roadtrip that you take. Unfortunately, most mobile wireless carriers will charge you extra fees for exceeding your data limits. 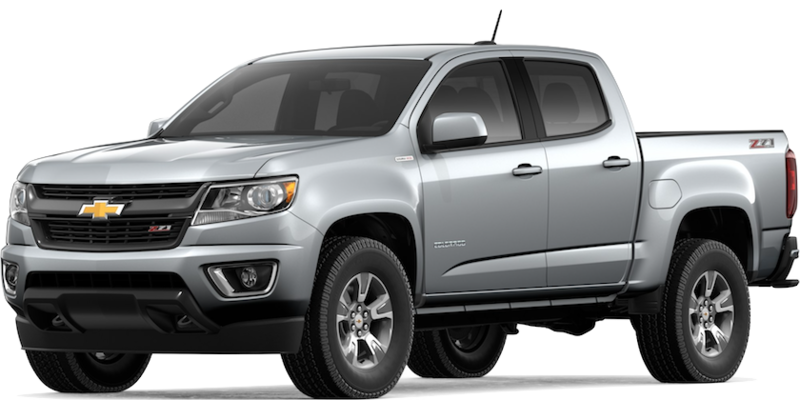 However, this will become a non-issue based on the fact that you can easily connect to the 4G LTE WiFi that is available through the 2019 Chevy Colorado. It’s simple and will make your life immensely easier. If you’re looking for a truck that will impress you at every turn, it’s time to see what the 2019 Chevy Colorado has to offer. Visit us at McCluskey Chevrolet! McCluskey Chevy is the best dealership to purchase your next vehicle from. Not only are they highly regarded due to the fact that they provide exemplary customer service, but they are also known for providing competitive prices on all of the most highly-sought-after vehicles on the market today. Whether you’re ready to purchase today, or just beginning the process, McCluskey Chevy can help. They have a highly-qualified staff of professionals who will be happy to assist you through the hectic and sometimes confusing process of purchasing a vehicle. The employees at McCluskey Chevy understand the fear and anxiety that can occur while making a large investment such as purchasing a vehicle. If you want to shop with the experts, look no further than McCluskey Chevy. Furthermore, they take their expertise one step further by providing an investor that will impress even the toughest critics. If you want access to the best vehicles at absolutely astounding prices, it’s time to shop with McCluskey Chevy. Simply give them a phone call or stop by today, you’ll be glad that you did.